Dehydration leads to stubborn, dryness and even wrinkles in skin. There are two options either you prepare a cream or lotion at home or else buy a readymade one. I chose the simplest option that’s why I keep on investing in new brands and lotions. Well it’s my duty as well to update you all about new products available in market. My today’s blog post is Herbs & More Vitamin Therapy Body Lotion Review. I have used couple of Herbs & More products before and have reviewed as well. About the Brand – Netsurf is one of the leading direct selling companies in India. Company is into various products range like personal care, health care, agriculture and home care. More than 70,000 people have been associated with Network and are earning by selling their products. The company was established in year 2000 and since then it has been providing quality goods to consumers. Packaging – Herbs & More body lotion packaging reminds me of something well yeah I remember now clean and clear lotion packaging. There are very few brands that opt for such packaging. 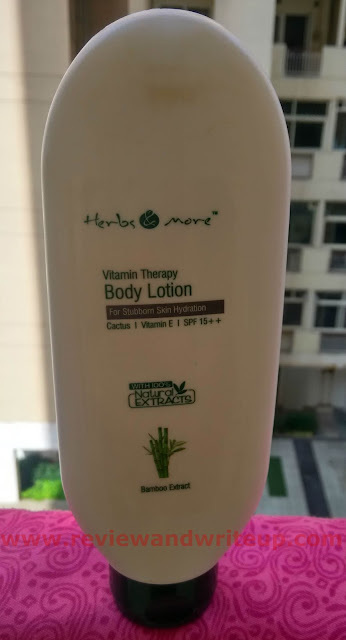 Herbs and More Vitamin Therapy Lotion comes packed in oval-cylindrical flat white colour plastic bottle which is quite sturdy. The lotion bottle has a dark green colour flip open cap to prevent spillage of the lotion. Earlier by looking at it I assumed that it will be difficult to keep it vertically (struggle in clean and clear) but hey I was proved wrong when it stood still even when I was done with more than 75% of the product. Packaging is good. The bottle I received was covered in dust. After removing the thin cellophane sheet from bottle I cleaned the jar. Then also some stains were so stubborn to not go forever. 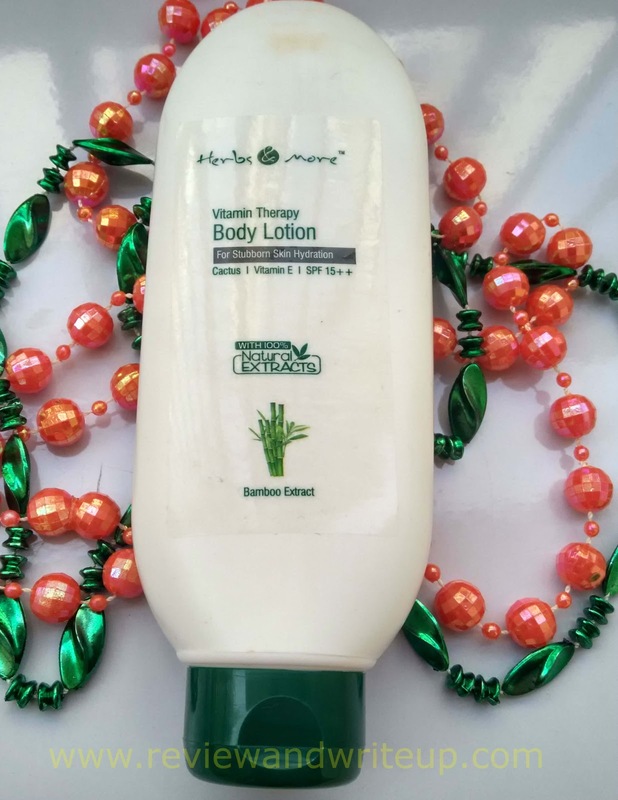 Herbs & More Vitamin Therapy Body Lotion is white in colour with thick consistency. The texture is creamy and it spreads easily and evenly on skin. Fragrance of Herbs & More body lotion is soothing to nerves and of a kind that you wish to sniff again and again. For an oily skin this lotion is effective in keeping your skin hydrated for long by making it soft and supple. But for dry skin this lotion dries out in few minutes and doesn’t make skin plump or bouncy. 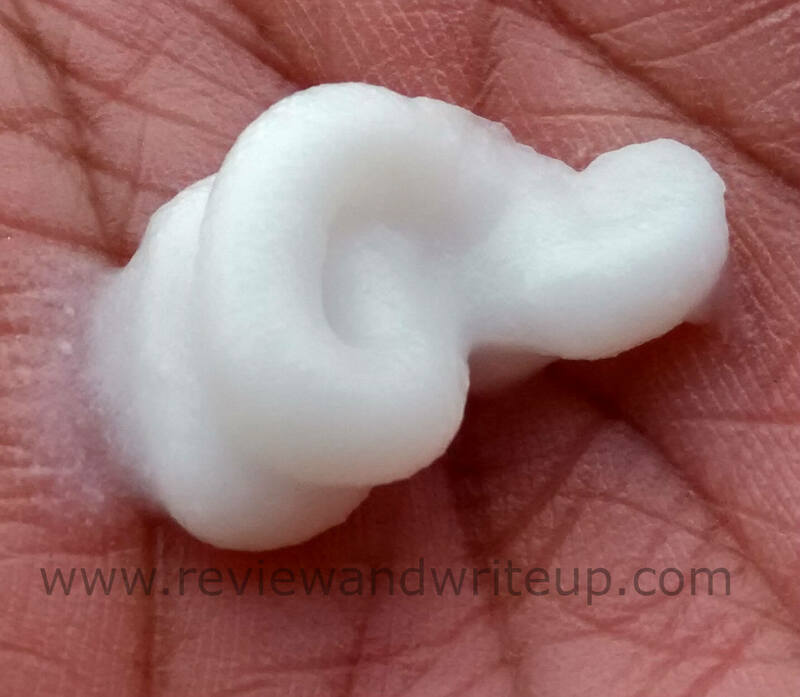 Once you start applying it the lotion dries out midway only. This lotion is definitely not 100% natural unlike some of netsurf products. It is an added advantage that this lotion comes with SPF. The packaging is convenient to use but since the bottle is heavy not apt for short term travelling especially when you wish to travel light. Herbs & More Body Lotion is priced at Rs. 650 for 200ml. This lotion is suitable for all skin types but on dry skin areas this doesn’t work very well. Since this lotion is not 100% natural so price is high provided it’s still new in market?